Move over, Justin Bieber with lifelike hairflop. Get lost, Zhu Zhu Pets; you’re last year’s news. Make some room on the toy shelf for America’s next great doll crazy. With his crazy facial hair, distinctive black gloves, and wicked catch phrase, New York gubernatorial candidate Jimmy McMillan is poised to be the hit toy of the 2010 holiday season thanks to the Jimmy McMillan “Rent Is Too Damn High” talking action figure! The doll is the creation of Herobuilders.com, the custom action figure company behind a whole line of interesting toys and collectibles. Jimmy McMillan’s doll comes in two forms: a standard model for $39.99 and a talking model for $49.99. 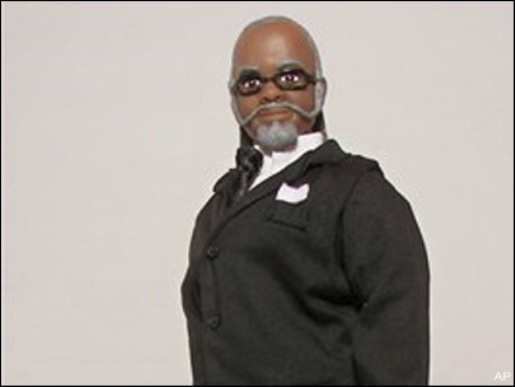 And in a few years, when Jimmy McMillan is forgotten again (unless he becomes governor of New York), you can just tell people it’s a Samuel L. Jackson action figure. Just put a little black-dyed cotton ball on his head, and he goes from Jimmy McMillan to Jules Winfield!